Keeping an up-to-date backup of your iPhone data is vitally important. Once your iPhone gets lost or damaged, it's your only hope of finding back photos, messages, and other valued data. We know how hard it is to manually make backups from time to time. 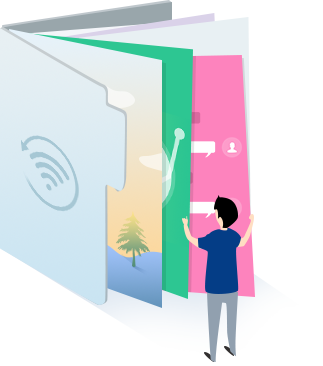 So, AnyTrans takes over the hard work and backs up your iPhone, iPad, and iPod touch data automatically, wirelessly and securely. You don't have to move one finger or even hardly be aware – all your essential data will be safely backed up daily, weekly, monthly, or whenever you prefer. 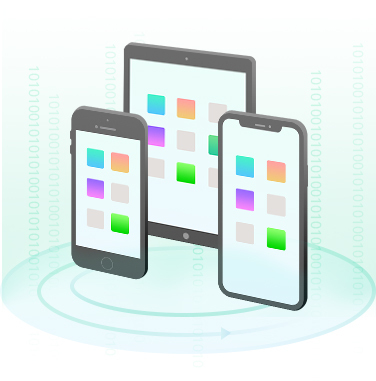 Backing up data frequently can be a pain, especially if you have multiple iOS devices — but not with AnyTrans. It automatically backs up everything you valued in every iDevice at any time frame you want, no manual effort needed. You can rest assured your backup is always up-to-date. Wireless and SilentYou don't need a USB to connect your iPhone to computer or go through tedious backup operations. You don't even have to take your iPhone out of pocket. The whole backup process goes automatically, silently, and wirelessly via your local Wi-Fi network. No manual operation and no interruption. AnyTrans is built with industry-leading security technologies to make sure your backups are 100% secure and private. It creates backups via your SSL-secured Wi-Fi. The backups are stored locally on your hard disk – no transition via Internet, so no risk of being cracked. Plus, you can make encrypted backups with unbreakable AES-256 encryption. You're assured to be the only one who can access your backup. 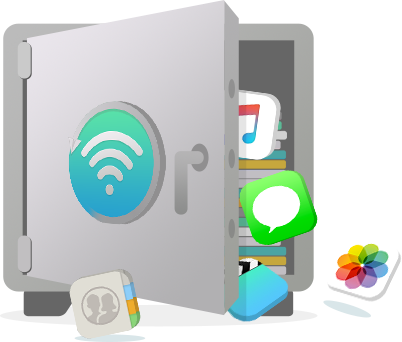 Why AnyTrans is Better Than iTunes & iCloud As A Backup Solution? Keep More Essential Data SafeThe more data a backup contains, the better chance you'll retrieve what's lost but valued. Knowing that well, AnyTrans backs up more essential data than iTunes and iCloud do. Photos, messages, contacts, app data, even imported images, videos and audio files. Everything that matters to you is safely stored. Faster Than You Can Ever ImagineAnyTrans works way faster than iCloud to wirelessly back up your important data in minutes. You don't have to connect your iPhone to a power source and wait forever. Just feel free to play around with it as usual. After you finish listening to a song, your iPhone data will have been magically backed up. Say Goodbye to Storage LimitWorking with optimized incremental backup technology, each backup created by AnyTrans consumes less storage. So you're able to store tons of backups without crowding your hard disk. Or, if you like, you can also store them on external hard drives. Say goodbye to storage limit. Keep as many backups as you want. To help you make better use of backups for data recovery, AnyTrans builds a backup manager. It lists all the backups you have with device name, backup date, iOS version and more info. You can directly delete old backups to free up storage. Also, you can preview all data and files within one backup file and select to extract what you really need. You have 100% control over your backups. Not just your own iPhone, AnyTrans is capable of covering all iPhones, iPads, and iPod touches in your family. You can even set different backup schedules for different devices. AnyTrans is intelligent enough to remember each time frame and automatically perform backups at the right time. It takes good care of your whole family's iOS devices with zero interruption. AnyTrans can also extract your data from iTunes backups and iCloud.